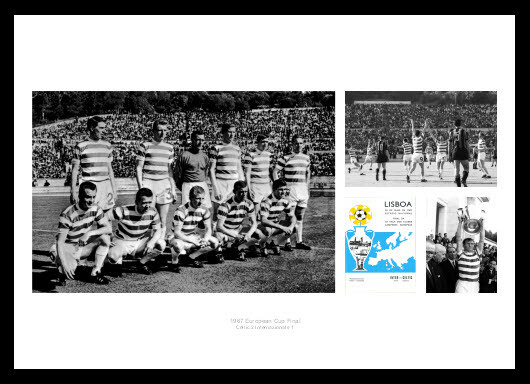 A magnificent montage of the famous night in Lisbon when Celtic beat Inter Milan. The photos in the montage are: The Celtic players lining up before the start of the game; the Celtic players throwing up their arms in jubilation after Stevie Chalmers (no. 9) had scored their second -and winning- goal; a reproduction of the original program cover from the final; and captain Billy McNeill with the trophy .